One of the great things about our store is that we offer so many different items from a variety of artisans, importers, and other interesting outfits. 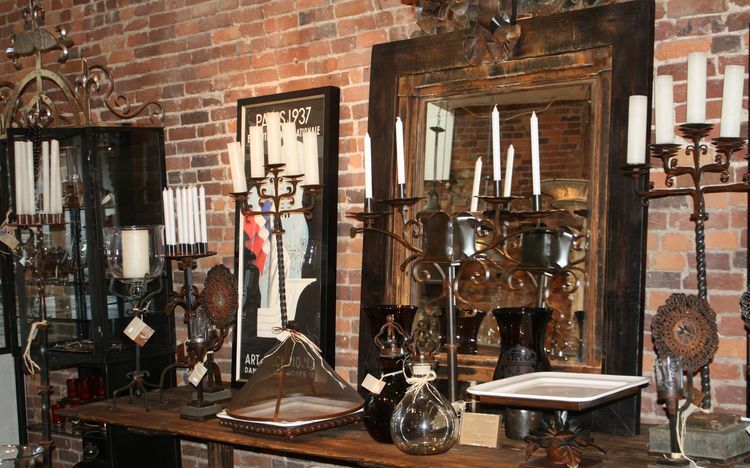 It means that no matter your tastes, you can find the perfect accessories to set your home apart. But we can’t stock everything, and custom ordered (and especially custom made) products take time. 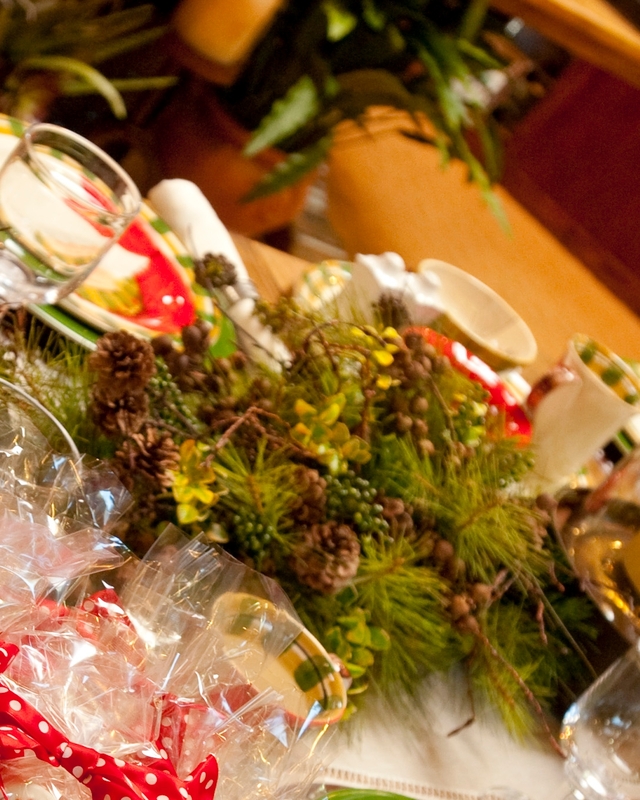 Therefore if you are looking forward to being the ulitmate hostess this holiday season, the best time to prepare is now; special table settings require special order. 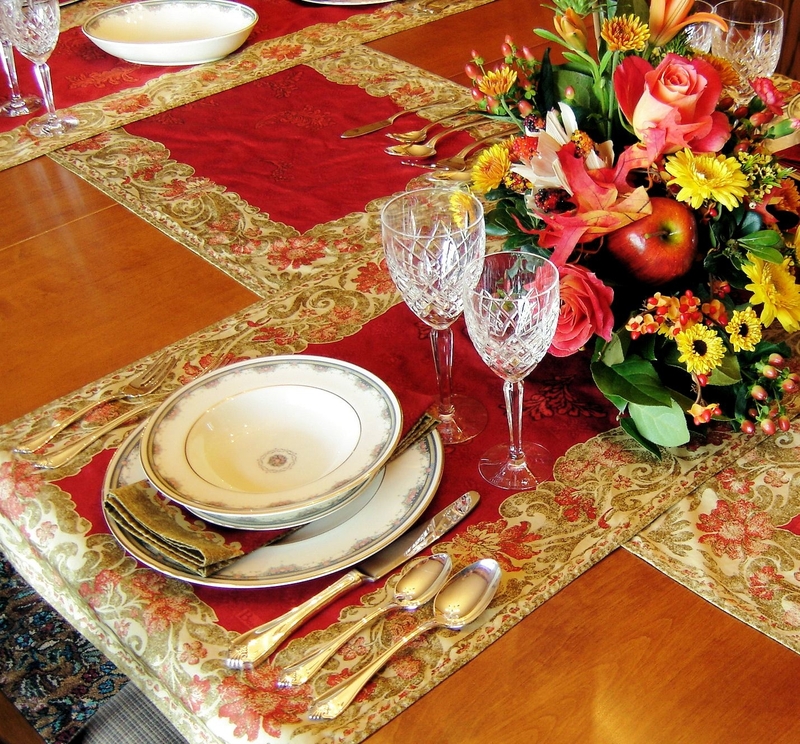 Just in case you didn’t feel like looking through a mound of catalogs, we wanted to share some of our suggestions for Thanksgiving, Christmas, and also Hannukah oriented place settings and components. The items pictured below are items that can generally be purchased from The Linen Tree, even though we do not stock many of them. Some are seasonal items, designed specifically for the fall. 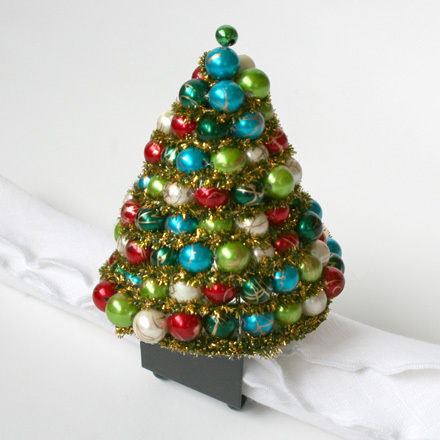 Others are accidentally holiday-friendly (and can also be used year round). When available, click on each image for a larger image. This is my personal favorite for the fall months (my name is Bill, by the way, I help to manage the store’s website). 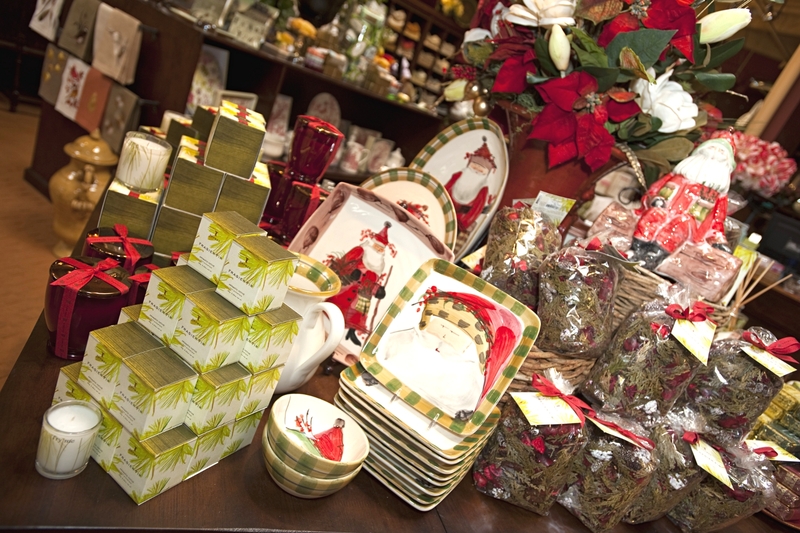 Beauvillé’s Mon Village is great for Thanksgiving and the fall months in general, yet it contains just the right amounts of festive red and refined green in order to spread the holiday spirit oh so subtly. 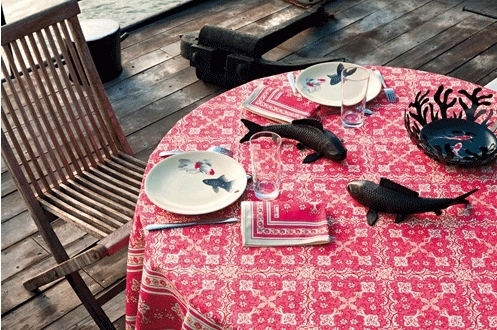 Are you are pleased with your existing, neutral tablecloth or the equivalent? 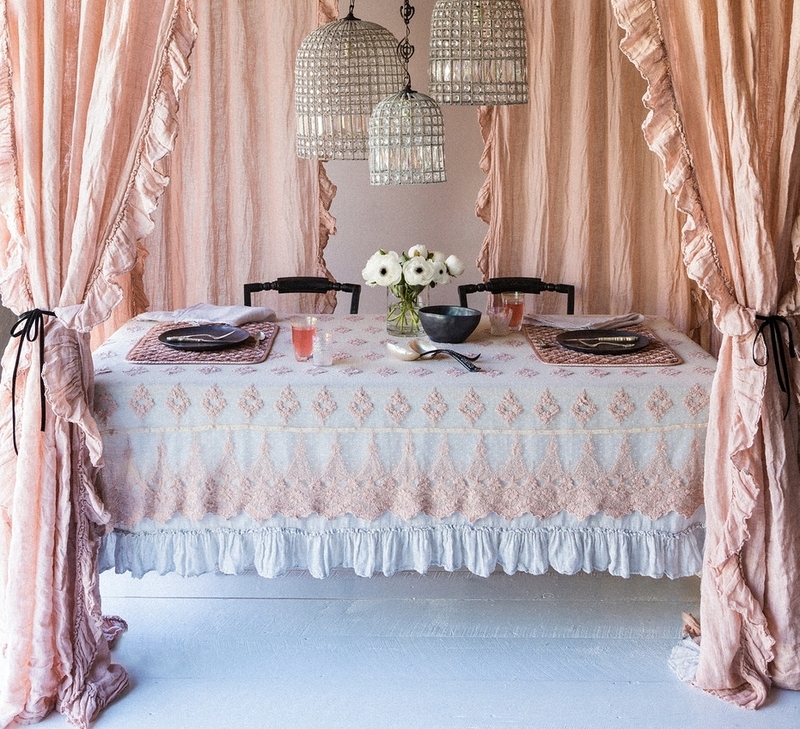 Add some beautiful Beauvillé Ponte Vecchio table runners to the mix. 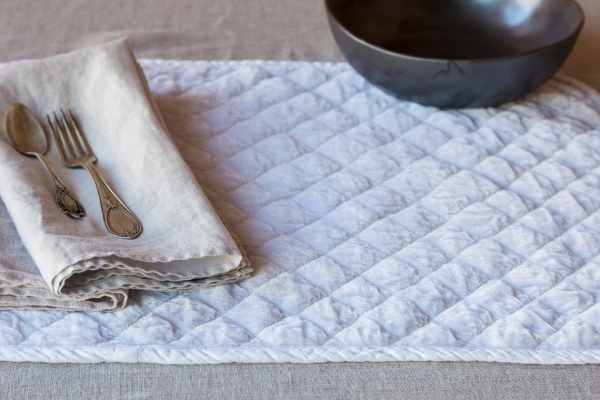 Table runners can negate the need for placemats, too! In the mood for something simpler, or you need something more versatile? 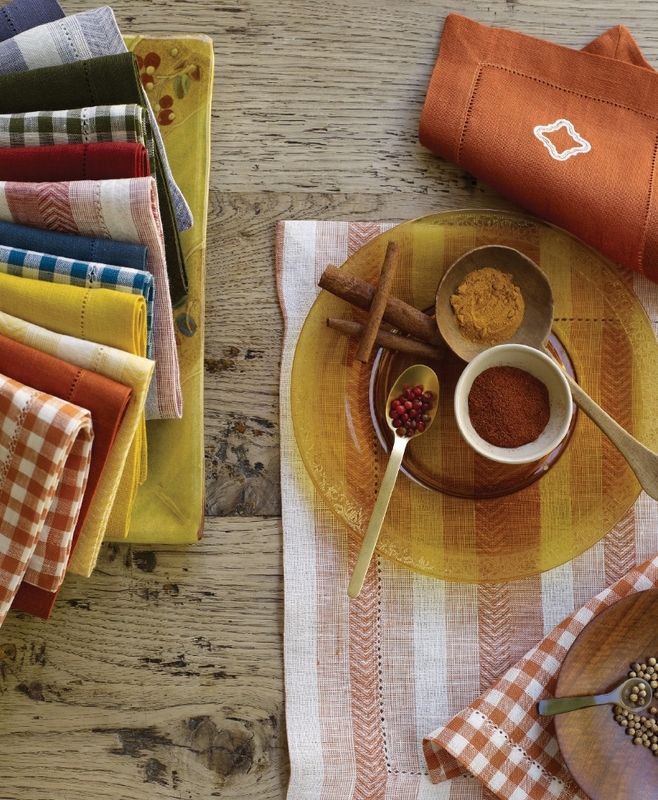 Sferra Festival table linens (tablecloths, placemats, and napkins) feature 100% pure linen woven in Italy. 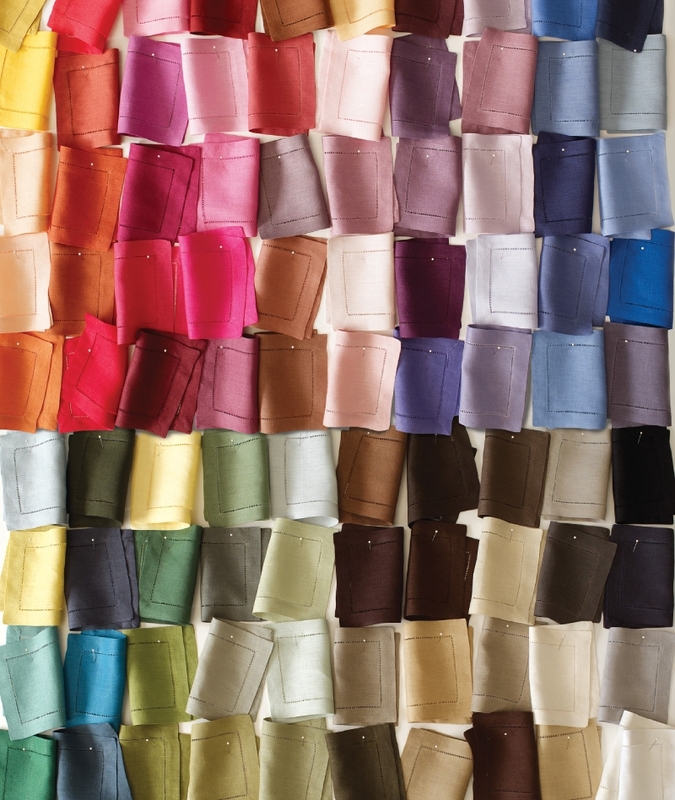 With your choice of 101 colors (yes you did read that right), you are sure to find the perfect shade(s) for your tastes and your table. 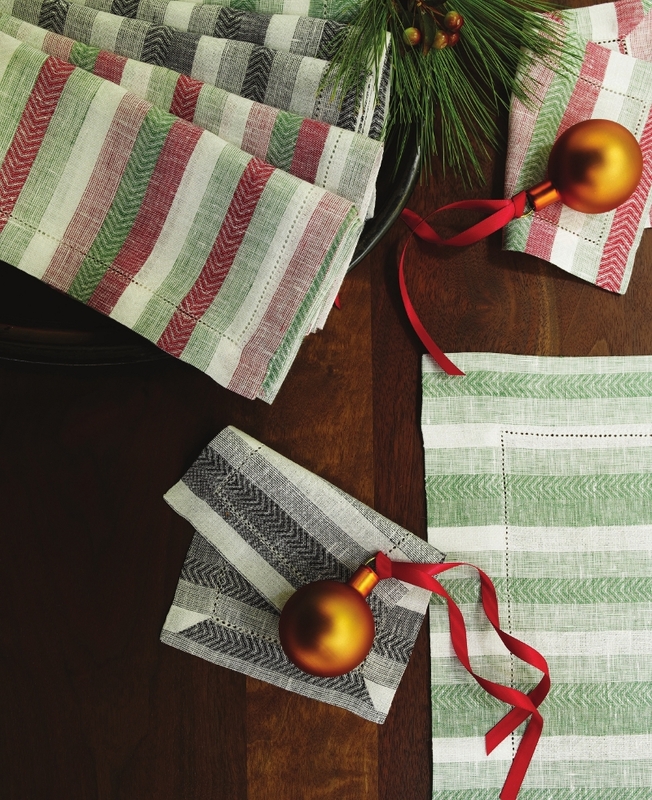 Or, for those looking for an especially unique, festive placemat, look no further than Sybaritic. 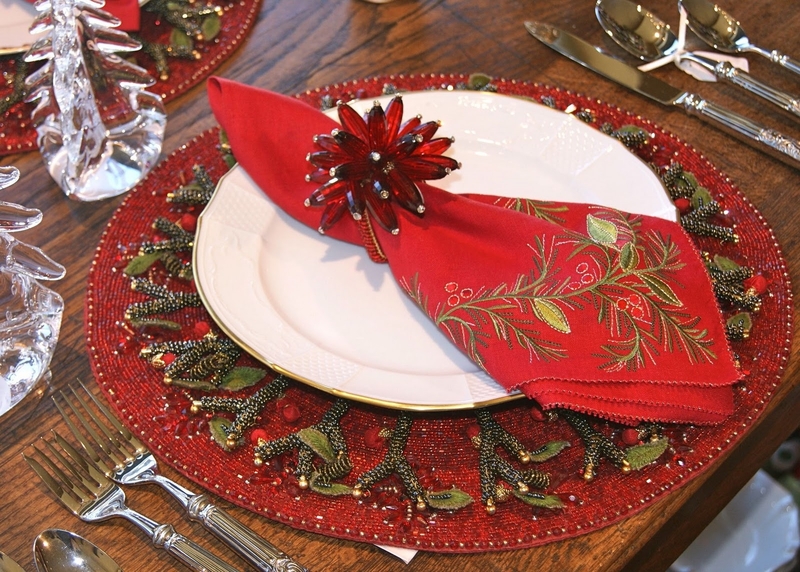 Branelli placemats – one is pictured below in Bronze with bronze bead trim (it’s all we had to photograph) – can be purchased in a metallic green shade, with red lace trim. 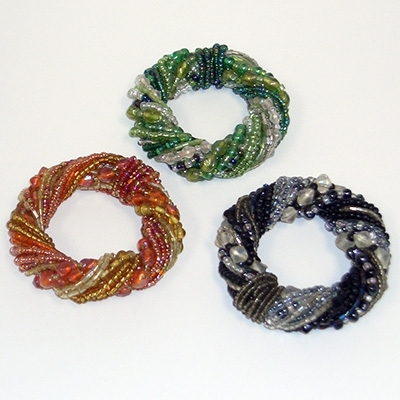 Or, you can choose silver bead trim for a more versatile placemat. And you can choose from nearly twenty shapes and sizes, too. 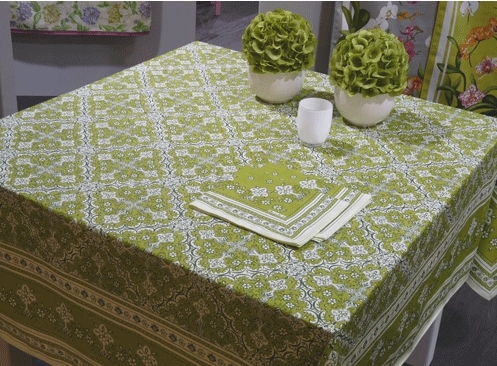 We have yet to see anyone order these placemats in Green with red lace trim, but we are curious to see what would result! For a more Hannukah friendly Sybaritic placemat, we suggest Boa placemats in Marine Blue with metallic bead trim. 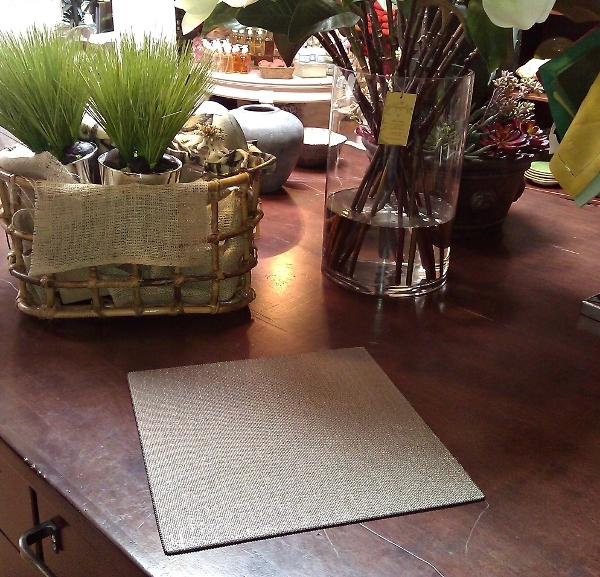 Lastly, Silk Velvet placemats from Bella Notte (a plush combination of silk and velvet) feel, and look, luscious. They are available in your choice of seventeen colors, including Bordeaux red, although the one below is pictured in White. Satin Velvet placemats are available, too. 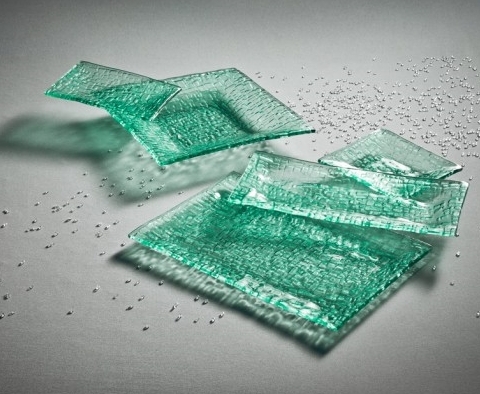 For those looking for a cutting edge table, I personally love this translucent green tableware by Annieglass. It is handmade in California. For a winter-specific look, Annieglass’ B.C. 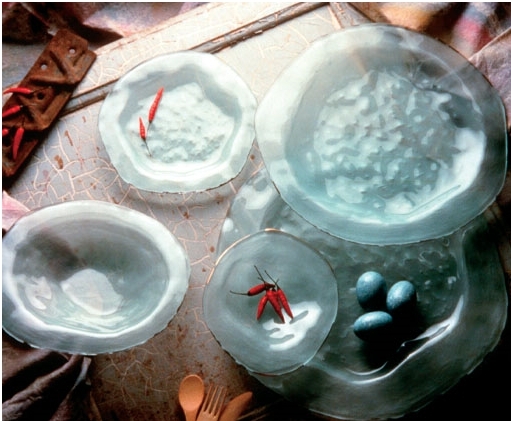 dinnerware presents a frosted appearance reminiscent of a refreshing winter breeze. 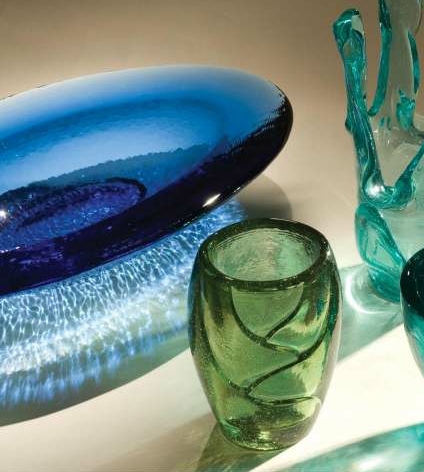 And for more similar options, check out Fire & Light tableware, handmade from recycled glass, also in California. 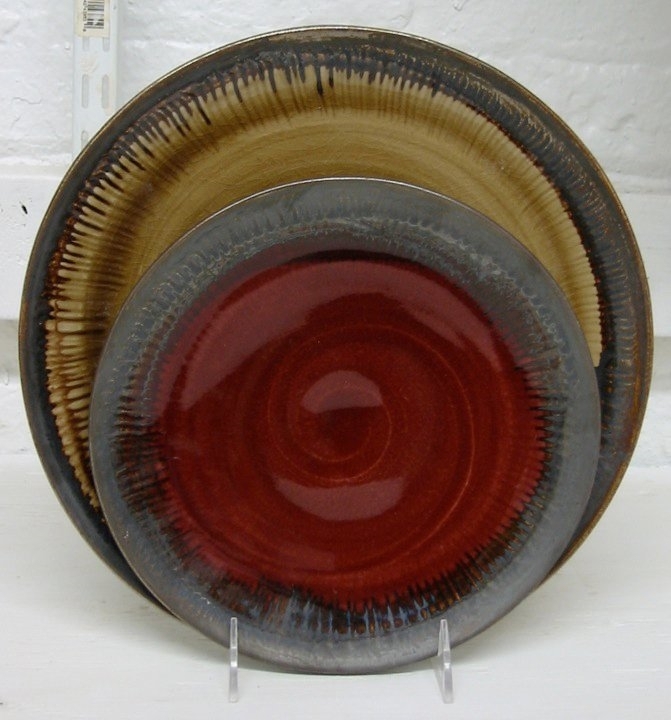 I personally prefer the Annieglass tableware but Fire & Light seems to be the more poular choice of late. 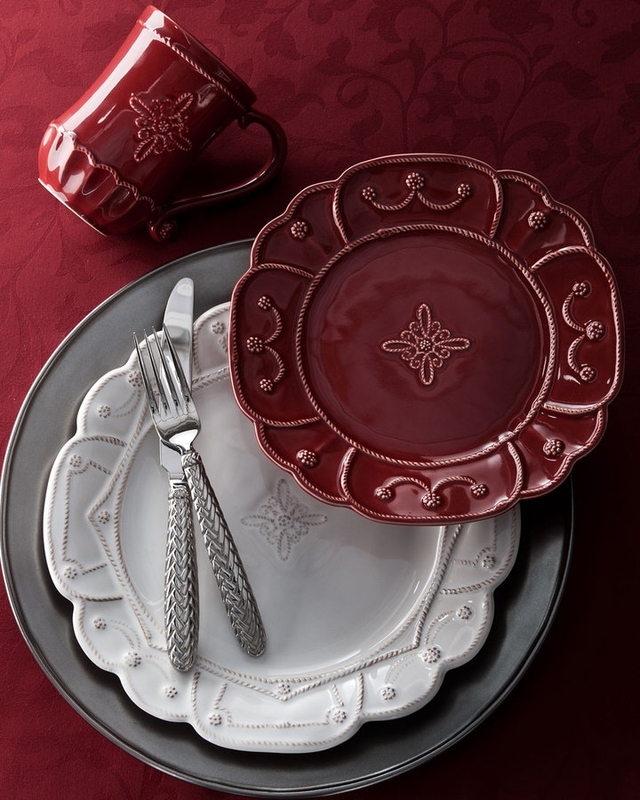 Something more traditional, yet just as unique: Crimson on Bronze tableware from Alice Goldsmith Ceramics (handmade in NYC) features a shade of red that is inviting enough for the holiday table and yet refined enough for any table. I believe it is also available in Crimson on White. 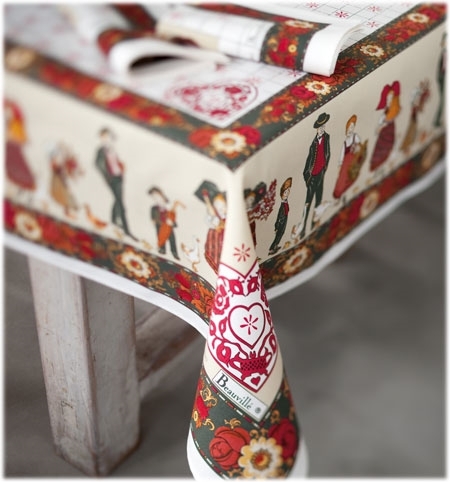 …but Juliska’s holiday collection is a bit more refined and a better fit for non-Christmas tables. 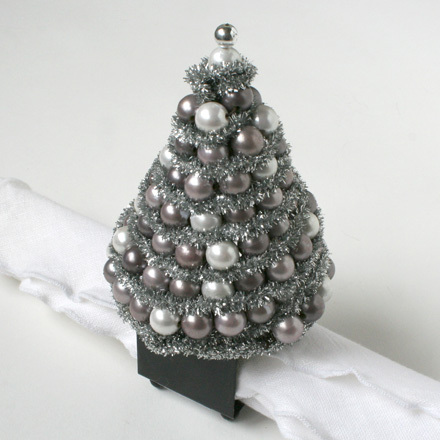 Juliska also offers Christmas tree ornaments, by the way. Of course, there is never anything wrong with traditional white dinnerware. And if you decide to go this route, we carry a variety of options, including Bernardaud‘s Chef Collection. 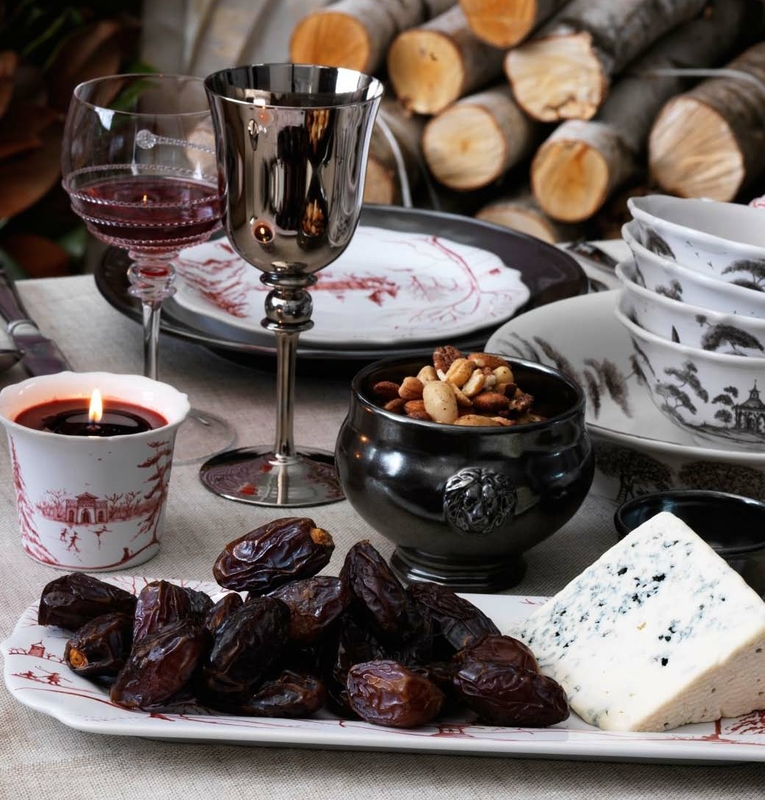 This is James Beard Award winning tableware that you will find in many five star hotels and restaurants, and it will last longer than imitations you will find elsewhere. While we usually have a lot of whiteware in stock, these Bulle and Foglia teapots are two of the more interesting options available by way of special order. 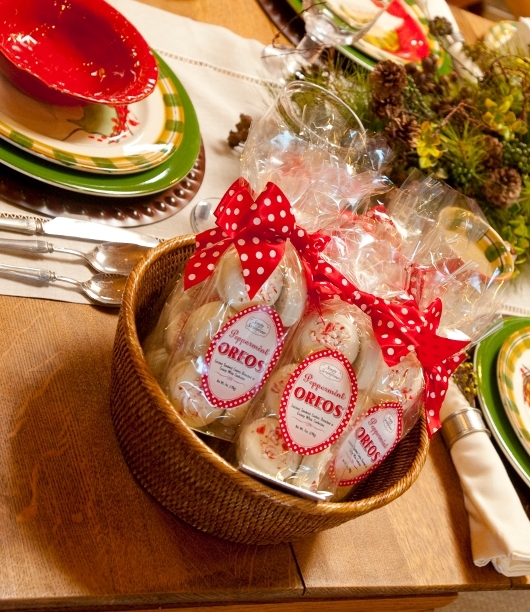 Packaged to perfection, these cookies look great on any Christmas table. Although, once your guests try one, they will no longer be neatly packaged. We do stock them come December, but it doesn’t hurt to order them in bulk in case we run out. Leftovers make great hostess gifts. 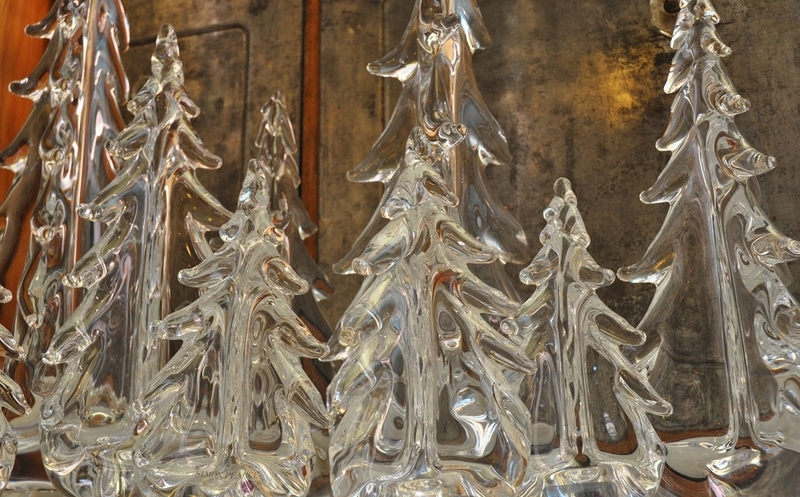 They might not taste as good, but Vermont Evergreens from Simon Pierce – handblown in Vermont – make an outstanding, versatile decorative accent. 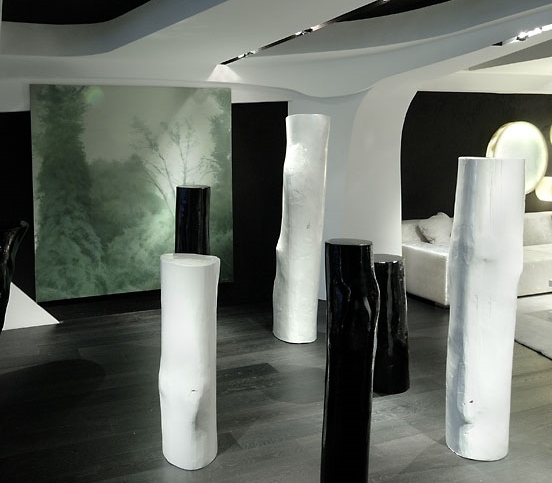 For a more classicly elegant look, ceramic jars, bottles, and more from Red Label are particularly unique. 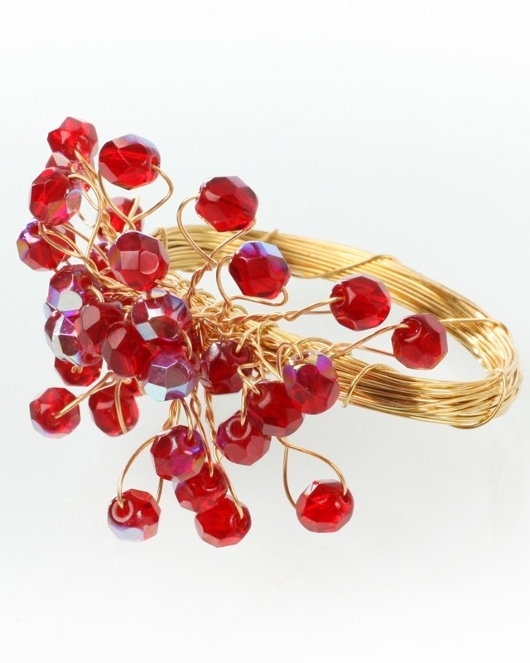 They are made to order in Mexico (please note, minimum order requirements may apply on special orders). Some miscellaneous selections from the line…. 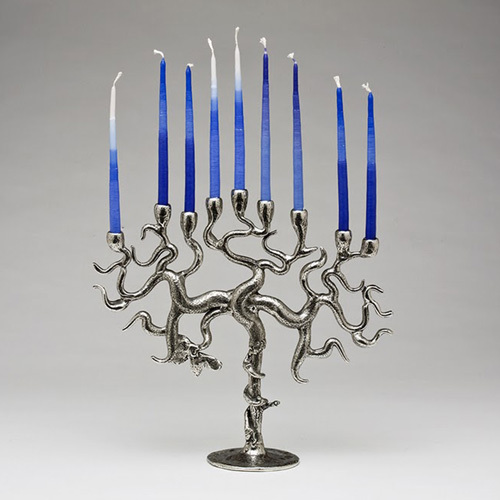 Jan Barboglio also offers many elegant candleabras, some of which could be used as menorahs. 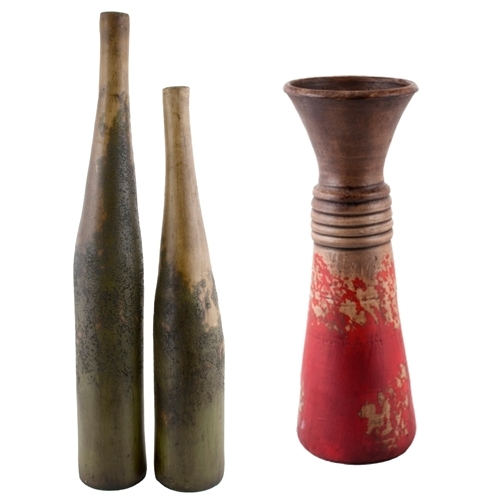 Celebrating the rustic western feeling of old Spanish iron, they will fit well with almost any holiday table. For the rest of us, these are some great looking Festivus Poles, even if they stray from tradition. Although, we do not sell them and we are not even sure who manufactured them. Credit to A-Cero. 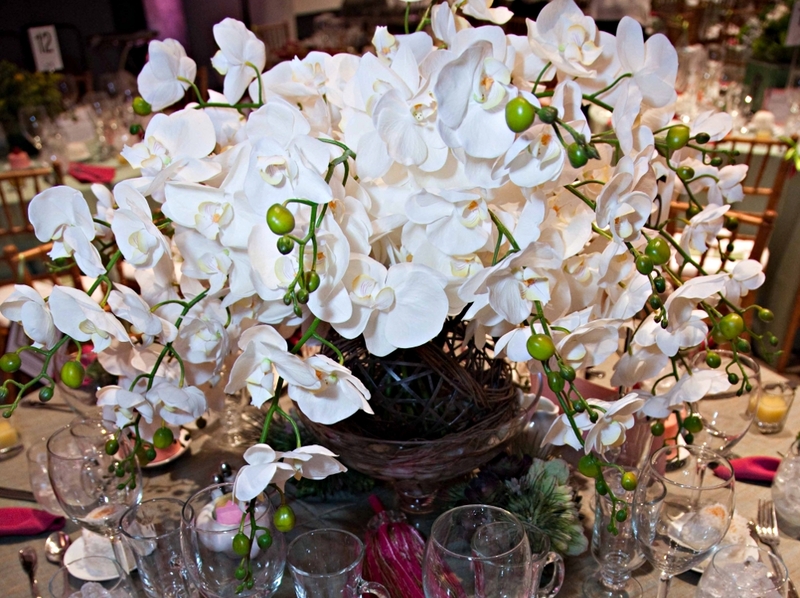 Did you know that The Linen Tree has its own floral studio, situated locally here in Scottsdale? 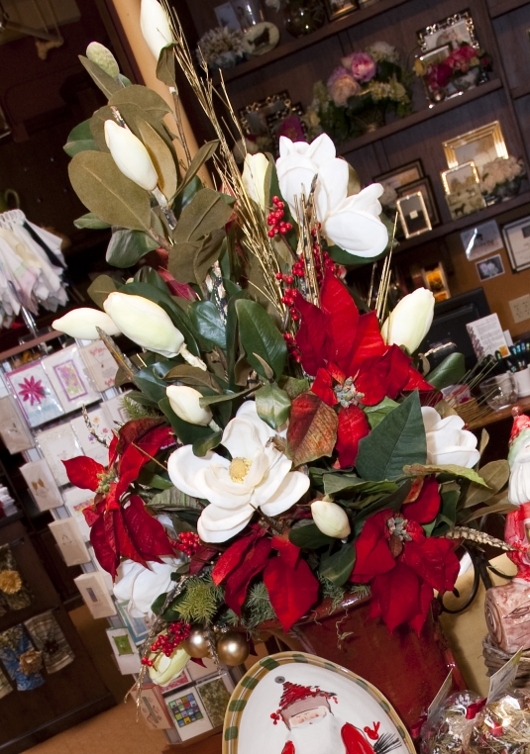 That means that we can work with you to help you determine the perfect floral arrangements to put an exclamation mark on your holiday table. From greens to succulents to roses and more, just about any floral arrangement can be made custom to order. When possible we like to use real dried flowers imported from exotic locales in France, Africa, and beyond. 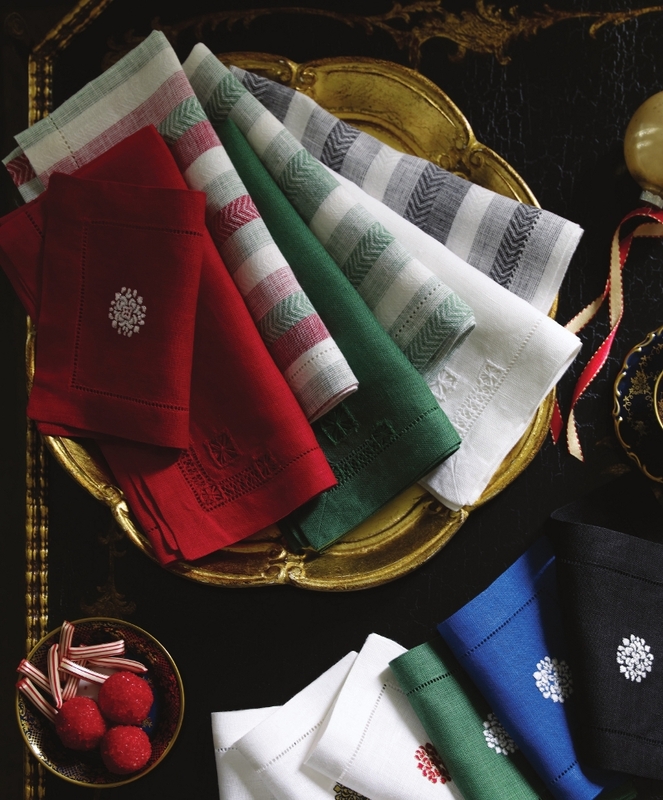 Others boast the finest silk from one of twenty different vendors, ensuring the perfect silk for the perfect arrangement. They are maintenance free and will last forever. 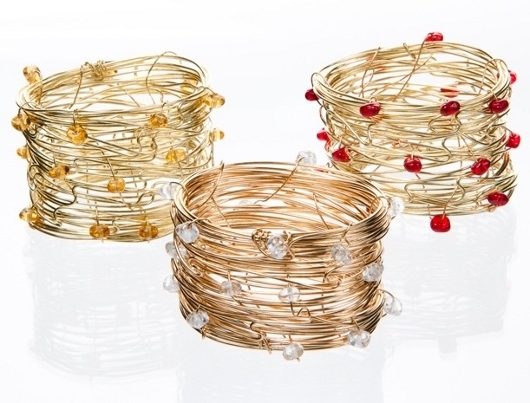 Deborah Rhodes’ Burst and Beaded Wire Cuffs napkin rings are better suited for year-round use. 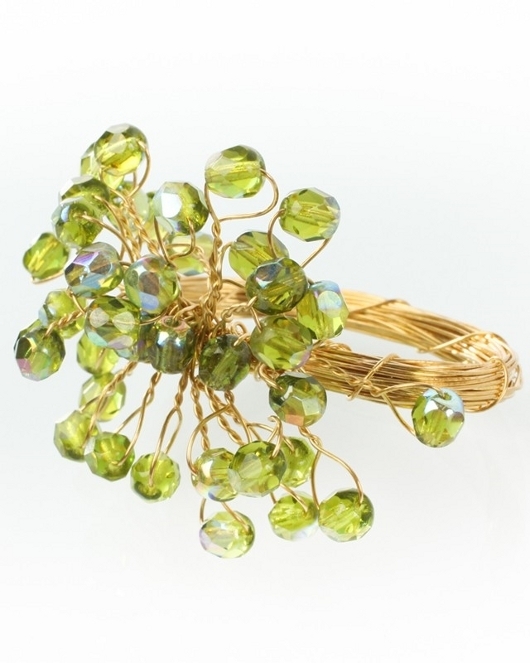 Not as popular, braided napkin rings from Sybaritic are my favorite for the holiday table. As with all Sybaritic, they are made to order in New York. This entry was posted on Tuesday, September 18th, 2012 at 5:11 pm	and is filed under Official Updates. You can follow any responses to this entry through the RSS 2.0 feed. You can leave a response, or trackback from your own site.